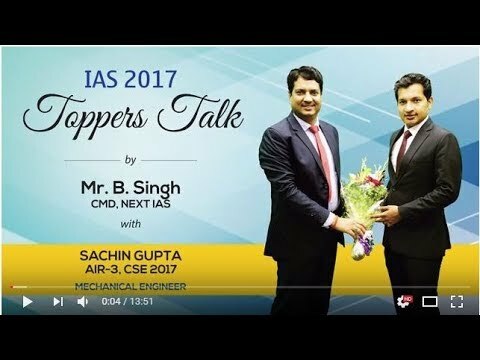 I am Sachin Gupta from Sirsa, Haryana , who secured Rank 3 in UPSC Civil Services Examination 2017 in my Third attempt. I had secured Rank 575 in Civil Services Examination 2016 and had got Indian Corporate Law Service (ICLS). I have done my schooling in DAV Centenary Public School Sirsa & graduation in B.E. Mechanical from Thapar University, Patiala. I will be dividing my article into 4 parts dealing with my journey & Prelims, Strategy for GS-Mains , Strategy for Optional and Preparation for Personality Test. You might have been going through interviews and articles of various toppers about their strategies but always try to build your own strategy. This is the first key ingredient of success, take the best out of everything available around you. In the course of preparation, I approached different places/institutes for just getting what I feel best in them. So from now on , whatever I will be writing try to see from your own perspective , whether you feel it is right or not for yourself and build your own strategy. Second most important thing I feel is evaluating oneself in course of preparation, understand your strengths and weakness, & work over it. For instance , after my first attempt I faced difficulty in getting good marks in my optional and decided to change it. After my second attempt I felt that I seriously need to work hard on GS part as well, thereby I joined Insights offline test series for Answer Writing practice, which I found to be a game changer in this journey from Rank 575 to Rank 3. I had joined IAS Baba as well, particularly for Optional Answer Writing Practice & also, I found it good especially in understanding how to approach a particular topic. That I will cover in my next article on General Studies Preparation Strategy. But just try to find your own strengths and weakness & work over it. Further I believe that hard work is the ultimate key for success. Trust me, this was the only thing we can bank upon throughout the journey. I have lived this journey through sheer hard work in different phases, even at the times when I was feeling whether , I will ever be able to clear this examination or not, when I will be out of the cycle of preparation & actually be a Change Agent. But here I would say, keep calm, be persistent in your goal and always believe why you want to be a Civil Servant, keep remembering that in your tough phases, believe me you will not only cross it but you will with flying colors. And last but not the least is Self-Belief, whenever you feel low, talk to your parents, mentors and well-wishers, try to get positive vibes from them. In the course of preparation we many times have self-doubt but that is normal & try to get motivation from wherever you can. I understand our core aim remains is to clear the examination and it should be that way. But live this journey from the perspective of becoming a better human being and transforming oneself how to be a change agent. Have the self-belief you will not only crack this examination and will be the change that we all aspire in the society! I hope that your preparation for prelims will be going on in full swing and you might be going through the feeling of fear and lack of confidence. So before writing the strategy that I followed for Prelims , I would like to talk about some Do’s & Don’t for those who are giving prelims within a month on 3rd of June, this year.